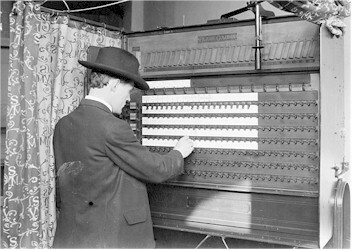 @skizix - When I was finally able to vote - Manitowoc, WI had the lever voting machines. Huh? We still use these in my district in Nassau County, New York. In fact, we still use the yellow bulb for light once we close the curtain! Those were fun -- Wisconsin had them thru the 1970's. There were all those little levers, and then there where the large levers on the side (vote all Dem, vote all GOP) that you could pull that would flip all of the little levers. No hanging chads there.